Within one week we have gone from 38°C heat to solid days of rain, central heating and 10°C. 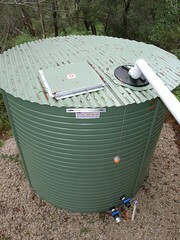 I had predicted that once the tank was plumbed in that we would have a 5 year drought but gladly I was wrong :) I think we have had 5 days of rain now and we have small streams running by our house down the garden. Check out the red level indicator on the side of the tank though!! Yippee.